"The best laid plans of mice and men", I had just gotten off the phone with Amy and her group from St. George. We were supposed to meet at the Canyon park before setting up the car shuttle for our hike through Ashdown Gorge. Amy had called to let me know the canyon was closed to through traffic due to a half marathon race event. 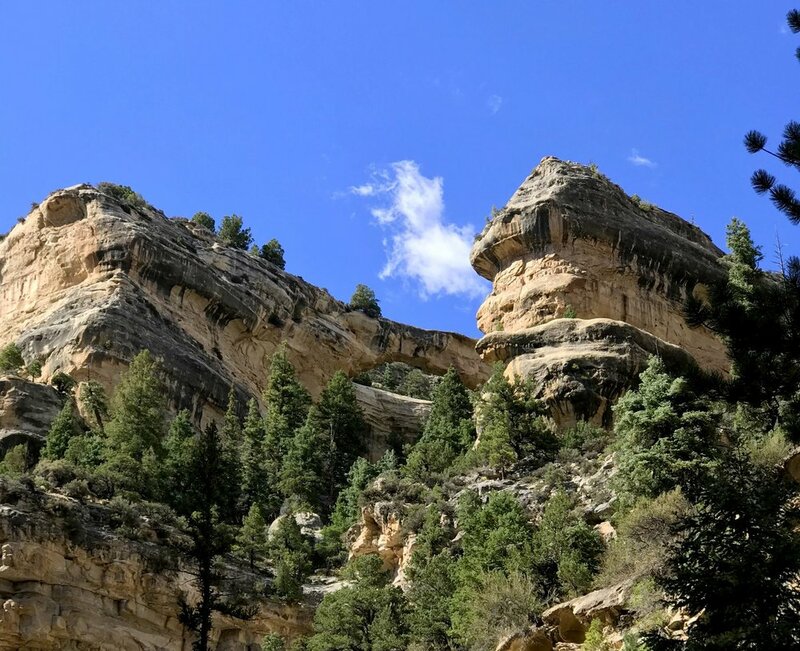 We met at the closed signs to discuss our alternatives and eventually decided to drive up Parowan Canyon and ask Linda and Jessica to shuttle a vehicle to our exit point after the canyon reopened in a couple hours. It would be a long way around to Crystal Springs, but it would at least allow us to start the hike before the expected 11:00 am opening of the canyon. Driving through Brian Head and on past the Rattlesnake trailhead (the usual starting point for a hike through Ashdown George) it was obvious that it was going to be a beautiful day. Crystal clear blue skies, just enough small clouds dotting the horizon to give depth and beauty to the rolling green mountain side. 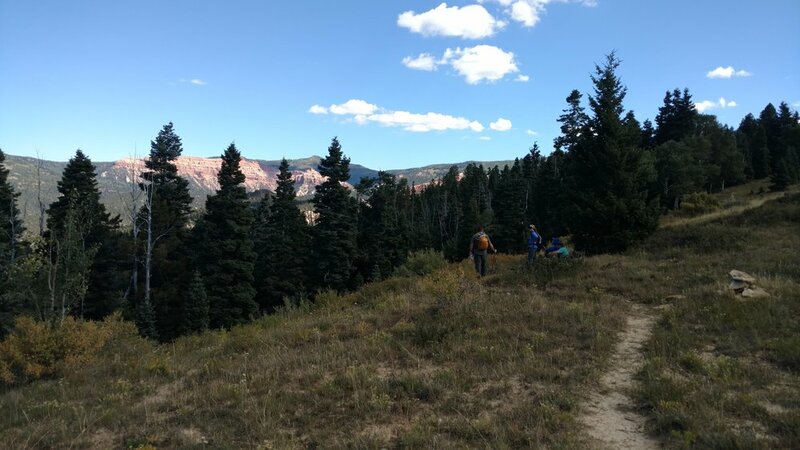 Groups of maple trees have already started to turn deep red and the occasional yellow leaves of a Quaky Aspen added to the serene view looking west over Cedar Breaks National Monument. 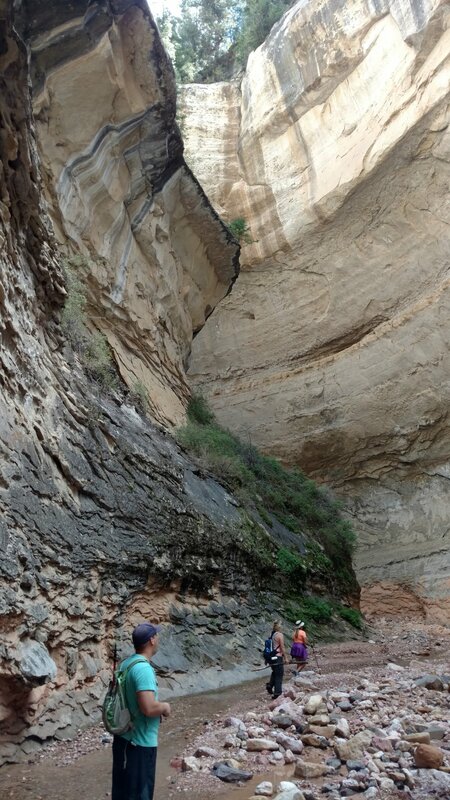 I was happy to see that there was no blockade on this end of the canyon. The half marathon race started at Woods Ranch recreation area which is below our trailhead at Crystal Springs. If a blockade existed it would probably be set up there to allow turn around or places to park and wait for the end of the race. We turned onto Crystal Springs road, and pass the open gate (closed when wet to avoid road damage) and drove to the wide parking at the beginning of Ashdown George Wilderness Area. We are the only vehicle in the lot as we slide out and apply the necessary bug spray and sun screen. I've wanted to approach Ashdown Gorge via this route for awhile now and I'm excited to finally get the chance. The weather is perfect and we question if jackets might be necessary in the high altitude morning chill. It is pleasantly warm in the sun, but a small breeze and shade makes it cool in a hurry. I elect to keep my small windbreaker in my backpack while others tie them around their waist or simply leave them in the truck. The route is a multi-trail hike as we start off on the Crystal Spring trail. In the near distance we can see a junction already in the trail with a trail running generally east and west, we are headed north. The area is laced with mountain bike trails and I have to consult the GPS map to make sure we are continuing on the correct route. We cross Crystal Springs and continue the hike through a grassy meadow. Moving into the pine trees we hike up and over our first ridge line. The trail is in excellent shape and looks like it has been recently worked on with shovels to widen the steep terrain. Glancing through the trees our first view of sections of Cedar Breaks is breathtaking as the morning sun is reflecting off the red and yellow dirt. Cedar Breaks is similar to Bryce Canyon in Hoodoos, windows, and spires. It differs greatly in the fact Cedar Break falls off steeply versus the more gradual decline of Bryce. Standing below the canyon the difference is even more noticeable. We cross another trail and continue on towards Potato Hollow. The trail makes a switchback and everyone groans as we realize we need to climb another ridgeline before our final long descent to the head of Ashdown Gorge. I'm a little surprised as well. 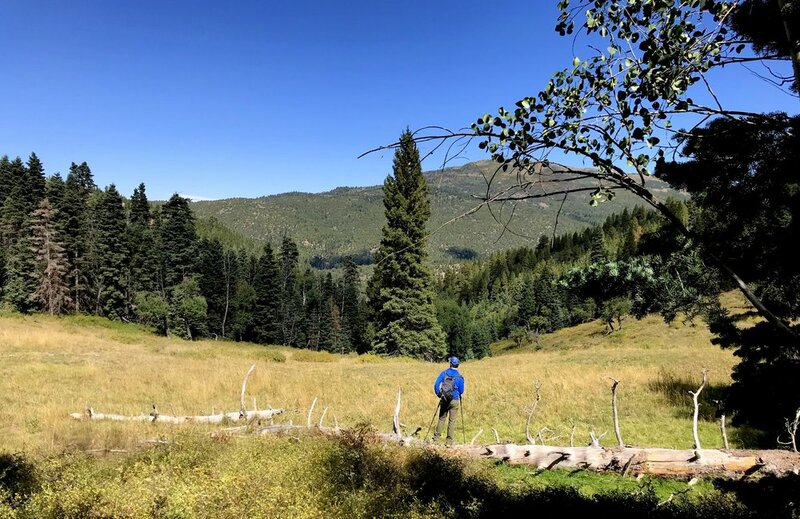 I had looked at the map to determine the route and calculated that we will save about 5 miles by taking the Crystal Springs route versus the traditional Rattlesnake Springs trail, but I had also forgotten that even 5 miles less is still a long hike to this remote area. There are two hikers who are wandering the area and we visit about the day. They hiked down the Rattlesnake trail and are planning on returning the same way. I moan inside for them. It's about a 3,000 foot ascent from here. We wish them the best of luck and thank our stars that's not our plan today. Lunch is good, but flies are bad. I don't recall a time in the forest when I've seen so many large flies. The flies move in groups, you'll be alone for a minute, then you'll have 20 big ol’ flies on you, I kept my sandwich in the plastic bag, closing the pouch after every bite. We soon finish our lunch and follow the trail to enter the stream. 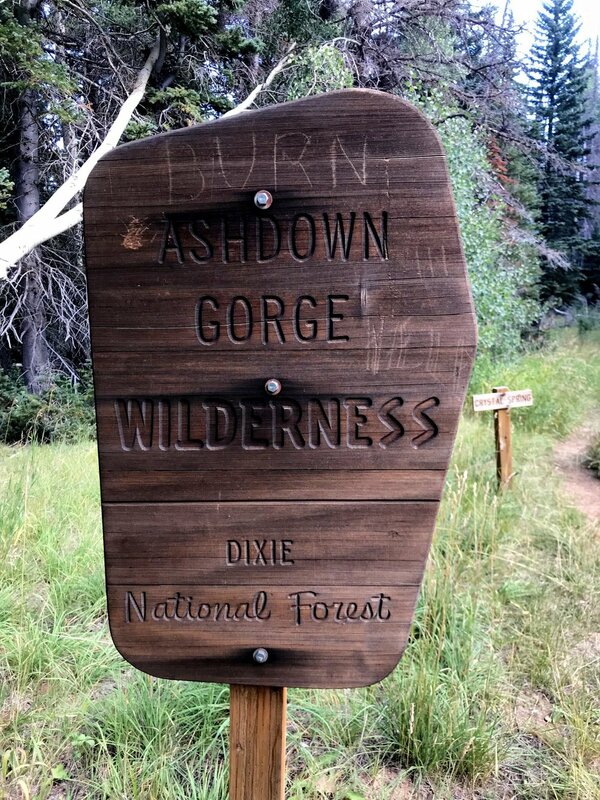 Ashdown Gorge is created from limestone and it is riddled with the crumbled remains that have washed out of Cedar Breaks. It is a rocky endeavor to hike along it's banks or cross the stream. Fortunately, bigger rocks are pushed by heavy water and tend to be on the outer edges and the smaller rocks stay in the main stream. This isn't always so, but a good part of the hike is pleasant by staying at or close to the water. The slower the water, the smaller the rocks. 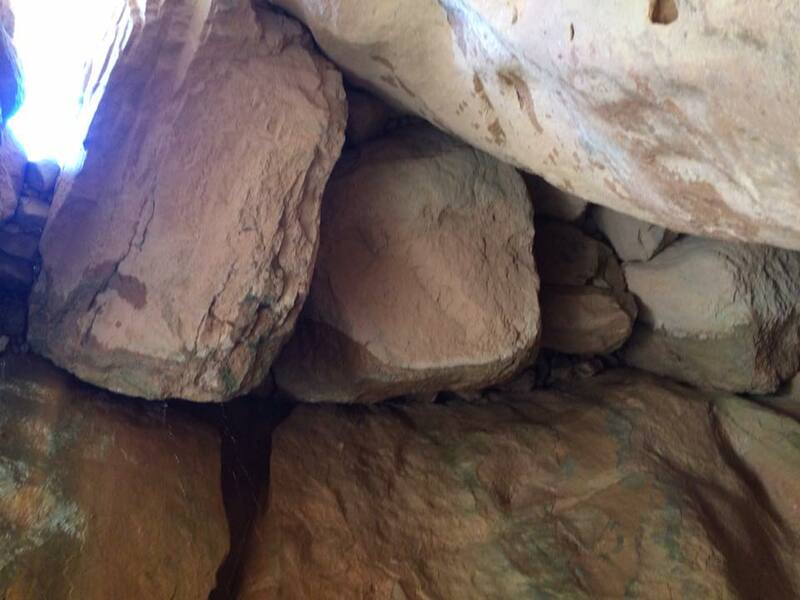 Another interesting thing about limestone is the pockets and caves that are created by water eroding over time. Most twists and turn in the river bed create an overhang of limestone above. The effect truly is beautiful as the rugged rock climbs overhead as we descend deeper into the gorge. We meet our first group taking shelter under some tall pine trees, they too came down Rattlesnake trail and are taking a break for lunch. I point across the way at the wild blackberry bushes and mention that I have found wonderful wild blackberries in the patch on other trips. They have children with them, so it might be fun to show them wild berries. I wander through the patch and to my dismay only find a lone berry, which I pluck and eat myself, so much for passing knowledge onto posterity. The limestone canyon walls rise quickly and we soon loose ourselves in the majestic wonder of this place. The size and scope soon lose meaning as we continue to follow the stream. One by one we begin to switch our camera’s to panorama mode simply to add scale to the pictures we are taking. At Tom’s thumb, we turn north again and follow the confluence of Rattlesnake and Lake Creek toward their respective waterfalls. This is a detour of about 1 mile, but is worth the extra steps. Hiking up the confluence another split in the river is found. To the left is Lake Creek and to the right is Rattlesnake Creek. We turn and hike to the right first. 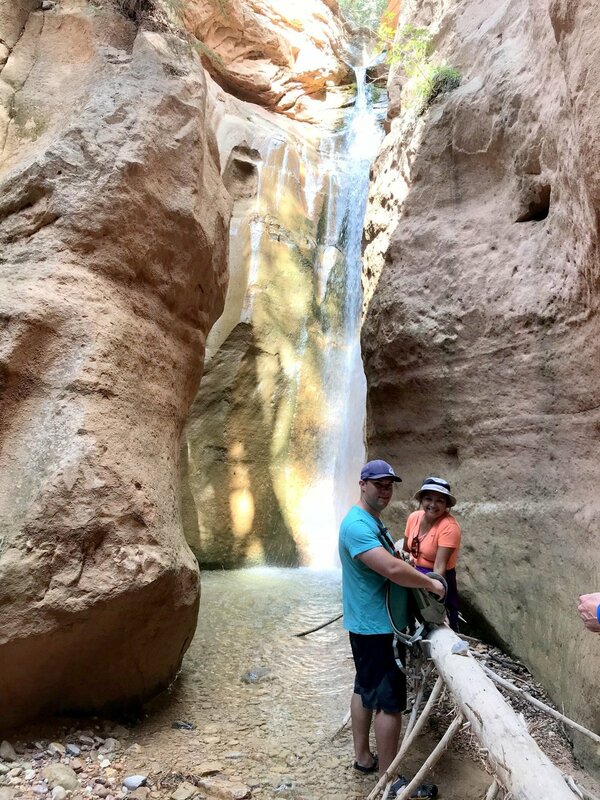 The distance is a little longer, but the canyon grows considerably more narrow and takes on the feel of a true slot canyon. Returning the same direction to the fork, take the hikers right (left on the original approach) and enter Lake Creek confluence. This is a short hike to the waterfall in Lake Creek. Formed by chockstones, the water of Lake Creek forms various pathways down through the rocky ceiling and it is different each time I visit. One thing remains constant, it is unnerving to stand under these massive boulders. We reverse course and follow the flow of the stream back toward the main canyon. After walking in the small stream of Rattlesnake and Lake Creek the main stream bed seems like a torrent as we emerge in front of Tom’s Thumb once again. Tired we continue our hike down Ashdown Gorge. As the sun continues to change positions throughout the day the effects of light and shadows are amazing. Most of the canyon is in shadow, but the occasional turn is highlighted in yellow, gold and red as sunlight is funneled into the canyon at just the right time. We reach Flanigan’s Arch and sit beside a massive boulder for a final break to enjoy the sight. Amy tells the story of a survivor show that they like to watch and the first episode of this season began with the leader rappelling off of Flanigan’s Arch. I’ve heard of people climbing up to stand on top of the arch, but it looks like it would be a long climb to the top. The canyon grows ever wider and soon we are walking along the river bed and it converges with the runoff from Cedar Canyon. What a beautiful day as we scramble out of the bottom back to the highway and civilization. Stats: 8.13 mi, 6h:35m car to car (not including shuttle pick-up /drop off). Pictures were provided by Lee, Amy, Judy and myself.